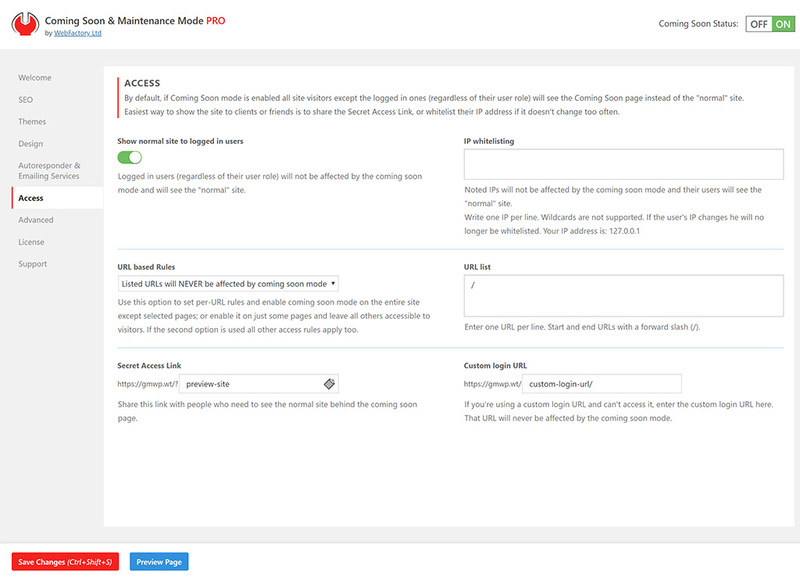 Coming Soon & Maintenance Mode Pages for WordPress - done in under a minute! Forget about complicated plugins that'll waste hours of your time. We know you're busy & need fast results! Coming Soon is extremely easy to use, has only the features you need and comes with themes that fit your business. A great image is worth a thousand words. That's why we've included 850,000 free, hi-quality images that will blow your visitors away + Instagram inspired filters! Professional, easily customizable themes that fit and adjust to any brand will enable you to build a page for your online or offline business in minutes. Nobody has time for complicated software. That's why the Coming Soon page is simple, intuitive & has only the features you need. It won't waste your time! You need traffic from day one! With built-in tests, checks and guidelines that Coming Soon plugin provides you'll be on the first position in search results in no time. The client, and client only, needs to see his brand new site while you're working on it. With the Secret Access Link feature they'll be able to do that with ease. 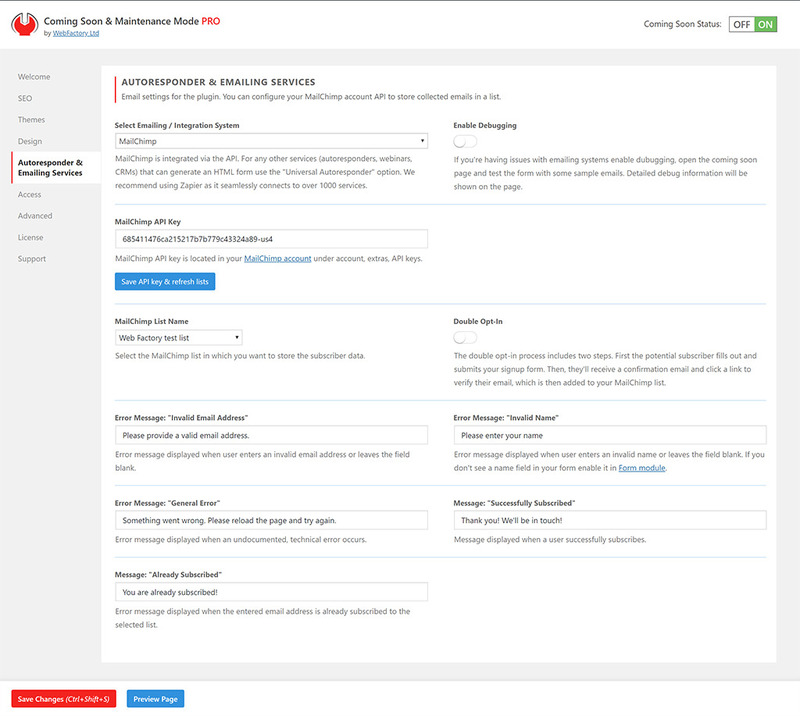 Coming Soon supports your autoresponder, CRM, webinar & marketing software and will push subscribers into them. If that's not enough there's also Zapier. are available in the plugin. Just enter a search keyword & pick one. who thrust the Coming Soon plugin to power their sites! Perfect for single site owners who don't like recurrent payments. Pay only once and own the plugin for lifetime. For agencies, webmasters & everyone who has more than one site. Best value for money with all the bells&whistles. Ideal when you need a coming soon page for a short time. Pay only for the time you use it. Cancel any time. You are fully protected by our 100% Risk-Free Guarantee. If you don’t like the plugin over the next seven days, we will happily refund 100% of your money. No questions asked. As a web performance engineer for LoadView Load Testing, I love that fact that "Coming Soon" is a lightweight plugin. It doesn't bog down the website or affect web performance in a negative way. If you're looking for a simple, optimized coming soon plugin, this is a great option. Lead Developer at Loomo Marketing Inc.
Is this the right plugin for me? Who should use it? If you want to create a beautiful coming soon page, landing page, sales page or an under construction page without touching any code, then you need the Coming Soon plugin. It's perfect for local business owners, bloggers, designers, developers, photographers, people who run webinars or sell online. What software do I need to run Coming Soon? What are the requirements? A self-hosted WordPress site running WordPress version 4.7 or higher, or a Business plan on WordPress.com. Nothing else. I'm new at this. Do I need any coding skill to setup a Coming Soon page? No, none what so ever! Everything is extremely user-friendly, drag&drop based and in most cases the only thing you need to do is choose a theme and change a few sentences of text. Will Coming Soon slow down my website? Absolutely not. Coming Soon is carefully built using the best coding practices and modern standards to ensure things run smoothly and as fast as possible. In fact, due to its specialized purpose, it's a lot faster than most WordPress themes. Can I use Coming Soon on clients' sites? Sure you can! Either purchase the Agency license or purchase a single license for each client site. We run a closed affiliate program. If you have a lot of client sites, you can earn additional income. Contact us to discuss details. Does this work on non-WordPress sites? No. Coming Soon is a WordPress plugin. It does not work on non-WordPress sites. We are working on a non-WP version, but it's not available yet. Where did the free version go? It's still here, and it's not going anywhere either. You can get it from the official WordPress plugin repository. No, we don't offer a trial. However, you are fully protected by our 100% No-Risk Money Back Guarantee. If you don’t like the Coming Soon plugin in seven days after purchase, we will happily refund 100% of your money. No questions asked. Powered by Unsplash, the unbelievable library of images gives you access to free hi-res images directly from the plugin's media library. Make your page even more unique by using image filters. A total of 9,903 hi-res images were found for New York.